In the area surrounding Wellesley there are numerous farms, including those in Weston, Medfield, and Dover. In the winter months, however, conventional farming is not possible in New England, and the farms must move to other activities to keep busy and to profit. Land’s Sake Farm in Weston adds maple sugaring as one of their activities, and on Wednesday gave a presentation at the Wellesley Free Library to explain exactly how maple sugaring is done. Katie Metzger, Land’s Sake Education Coordinator, not only spoke about the process, but took kids and parents alike outside to tap a tree themselves. 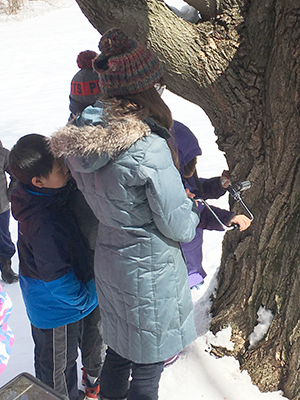 Outside of the Wellesley Library there is a sugar maple, which allowed the kids to see sugaring in action. 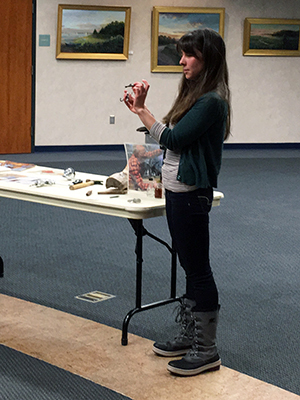 Land’s Sake Education Coordinator Katie Metzger brought a hand drill, allowing Wellesley’s kids to be a part of the maple-tapping process. Metzger began by reading a picture book entitled “Sugarbush Spring,” and while short, it was thorough in its explanation of the process – not only in how sap is extracted from the tree, but then how that sap is made into maple syrup. The first step is to find a sugar maple. “How can we tell if it’s a sugar maple?” Metzger asked. The leaves, bark, bud structure, as well as the branches are all indicators of the type of tree. Other maples can be used, however, more sap can be collected from a sugar maple. “It takes about 40 of these buckets of the sap for one bucket of maple syrup, so we’re still collecting a lot of buckets,” she said. There is a very special time of year when sugaring must take place. “We need days that are warm, not too warm, like 40/50 degrees and nights that are freezing,” explained Metzger. “When it’s really cold, the carbon dioxide gets really tiny, and the space around it gets filled in with water coming up from the roots. In the day time when it gets warmer, it stretches out and gets bigger and then there’s no more space for the water, so it gets pushed out. When there’s a hole, the sap gets pushed out when it expands.” Metzger showed a sample of sap and then of syrup, showing the vast difference in the two. There are a great many steps after collecting the sap to get to syrup. However, on Wednesday, the goal was to collect sap. All the kids in attendance, along with their parents, followed Metzger outside, where they took turns using a hand drill to make a hole in the tree, placed the spile in the hole, and waited for sap to appear. While the weather was a bit too cold for the sap to flow, the collection bucket will be left up for a few weeks; any visitors to the Wellesley Library can see the sap collecting process in person.